Wesson Oil has been around for more than a hundred years – though its composition has changed over time. It originally was a cottonseed oil. Today it is a mixture of oils, and may contain soybean oil, corn oil, canola oil, or sunflower oil. I don’t recall what type of oil my mother used, but for baking I sure do remember the cans of Crisco!! I still use only Crisco for my pie crusts. Every time I’ve tried something else, it just hasn’t been the same. If it was good enough for my mother and grandma, it’s good enough for me! It sounds like Crisco still works well for you when making pie crusts. I’ve had trouble with Crisco in recent years and ended up with “tough” pie crusts. I blamed it on ingredient changes across the years – but maybe I’ll have to give it another try. So do I. We also had the cans of Crisco, and we totally bought into whatever the ads at the time said about Crisco making crispier chicken and more tender pie crusts. Another surprise for me. The first oil I remember was peanut oil. I was about 6 or 7 when I tasted that. My family mostly used margarine. I don’t remember ever using peanut oil when I was a child though I think that it was sold in the U.S. Various vegetable oils (soybean oil, corn oil) were popular back then. My family also mostly used margarine – which seems a bit odd to me now since I grew up on a dairy farm. That does seem odd but maybe it was important to sell as much of the dairy production as possible. Maybe. . . I also wonder if margarine was considered more modern and healthier than butter during mid-years of the 20th century. Certainly my parents thought it was healthier. If I recall correctly, when people first started worrying about the constituents of what they ate, which seems to me to have come on during the 1970s, that was one of the selling points of margarine. Supposedly it was better for you as it didn’t have that heart clogging fat, the story went. At some point, of course, the news flipped and now margarine is regarded as more dangerous than butter. I’m glad of that, as I abandoned margarine a long time ago. That’s not why my folks used margarine, however. I’m not sure why they did. It’s interesting that it’s been around that long. I don’t remember it from my childhood, although it probably was on a shelf somewhere. I do know that when I began keeping oil in my own kitchen, Wesson was the brand I chose, so I’ll take that as evidence that it was something I already was familiar with. I’m amazed by the variety of oils on grocery store shelves today, but when I use oil now, it’s usually olive. I didn’t know that cottonseed was editable. That should read edible. My coffee hasn’t kicked in yet. Is it just me, or is this as horrid as it sounds? I prefer to use a single oil of my choice, usually preferring olive or rapeseed. We don’t get many oil mixes in England, so maybe I’m just not used to the idea. Cooking oils that contain a mixture of vegetable oils are common in the U.S. – though my sense is that single-ingredient oils have become much more popular in recent years. Olive oil definitely has grown in popularity, and it is generally considered much healthier than many of the other oils. Getting oil in a “handy can” was considered sooo modern back then. 🙂 It’s nice to hear that you enjoy the posts with the ads. My mother-in-law used to talk about Oleo when I was first married to her son. I had never heard of it, but it’s what she used when she lived in Pennsylvania. I prefer olive oil for stove top cooking and coconut oil for baking. And my mother used white Crisco. Maybe oleo is an archaic Pennsylvania term. I grew up in Pennsylvania and we always called margarine “oleo” back then – though I think that people living there now would refer to it as margarine. When I was a kid we used “Oleo Margarine” instead of butter for everything. I didn’t start using real butter until I left for college in the early 1980s. Now it’s generally agreed that margarine isn’t a very healthy alternative for anything . . . 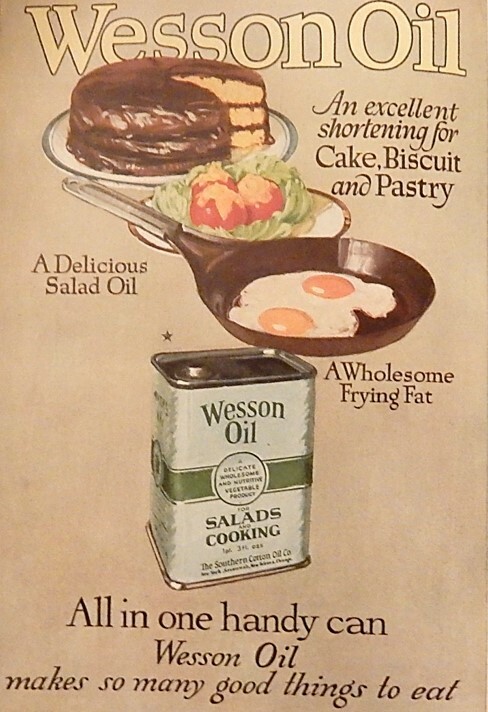 In thinking on it, my folks always used something like Wesson Oil for cooking, and very rarely bought anything like Crisco (i.e., a solid fat). My mother was a really awful cook (which she’s freely acknowledge) and rarely tried anything like pie crusts, so that’s perhaps an element of that. Anyhow, now we use Crisco for some things, corn oil occasionally, but olive oil quite frequently. We never used olive oil for cooking when I was young, and I don’t think anyone else around here did either. Olive oil has become so much more popular over the last 20 or 30 years. I have similar memories of using lots of Wesson Oil and other vegetable oils when I was a child. Yes, I think my mother used Wesson oil also. I also can’t recall olive oil being used when I was a kid. My grandmother, on the other hand, kept a small tub of bacon fat on the back of her stove. She used it freely and her food was fabulous. 😉 I prefer butter over margarine these days, but just today read an article that butter has pesticides, several, in fact. Can’t win I guess, or maybe use very little of both? My mother occasionally used bacon fat to make fried potatoes. I used to think that she should be using a “new” fat instead of reusing the bacon fat. Your comment makes me want to try making fried potatoes with bacon fat to see if I like it now. I may have been totally missing a flavor treat. I agree – It almost seems like we assumed that whatever was sold in the grocery store was good for us.